The short, conical bill of our quiz bird suggests a sparrow, finch, or other seed-eating bird. Almost all of our seed-eating birds however show prominent streaking or spotting somewhere in their plumage; our quiz bird is a uniform grayish brown overall and lacks head stripes, wing bars, or breast streaking. The plain grayish brown plumage might recall a Dark-eyed Junco but a DEJU would have a contrasting white belly. A female or immature Indigo Bunting would be warmer brown and would show fine streaking on the breast. Like the Indigo Bunting, a female or immature Lazuli Bunting would be warmer brown, and would have a buffy breast that contrasts with a paler belly. A female or immature Blue Grosbeak would have contrasting buffy wingbars and a more massive bill. So what's left? Well, Brown-headed Cowbird, the females of which match our candidate both in color and plainness of plumage. 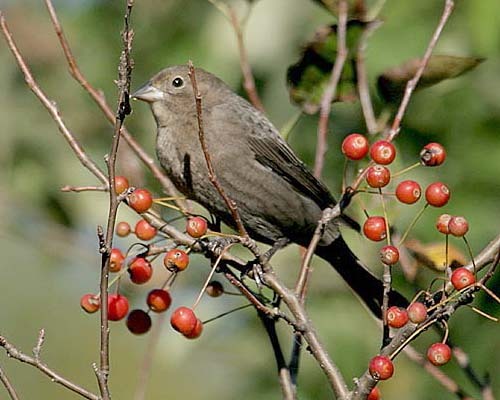 This female Brown-headed Cowbird was photographed by Kanae Hirabayashi at Montrose Point in Chicago on October 9, 2007.